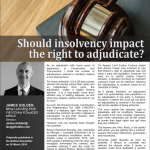 Should Insolvency Impact on the Right to Adjudicate? As an adjudicator with many years of experience in Construction and Procurement, I know the number of adjudications referred in Northern Ireland is not slowing down. For those unfamiliar, it is a 28-day process wherein the parties submit their cases and an independent third party, the adjudicator, makes a legally binding decision. It is a less-costly, more time-efficient way of settling disputes, as and when they happen, without the need to ‘go to court’. As such, the Housing Grants, Construction and Regeneration Act 1996 (“HGCRA”) made it a statutory right. Any party to a construction contract can refer a dispute to adjudication “at any time” (Section 108); no conditions or limitations. However, this has recently been brought into question. Bresco Electrical Services was contracted by Michael J Lonsdale (Electrical) Ltd to complete electrical installation works. A dispute arose in December 2014, with both parties maintaining that the other had wrongfully terminated the contract, and Lonsdale claiming it was due costs for having to replace Bresco. Bresco referred the dispute to adjudication in June 2018, three years after going into liquidation. Lonsdale asked the adjudicator to resign on the basis of this insolvency and issued court proceedings when he refused. Justice Fraser determined that, under the Insolvency Rules, upon the appointment of a liquidator, all dealings under construction contracts are wrapped up and treated as a single sum to be determined. There could not be multiple disputes at once, therefore an injunction was granted preventing the adjudication’s continuation. As it stands, therefore, an adjudicator does not automatically lose jurisdiction in an adjudication if one party is insolvent. However, it seems the court will not allow an adjudication to continue if the decision will not be capable of being enforced. The court upheld the statutory right to adjudicate, with no conditions. However, the reality is far more complex; insolvency does mean companies can be left unable to invoke their legal rights and get what they are entitled to. The lessons are, then, firstly, to be careful with whom you are getting into a contract. Acquire the proper references, guarantees and insurances. Secondly, settle disputes as soon as possible. If Bresco or Lonsdale had referred the dispute when it arose, a decision could have facilitated a quicker resolution to the matter. Lastly, despite the accessibility of adjudication compared to earlier methods of dispute resolution, it is still a complex and often daunting procedure, with cases like this bringing to light new questions and issues every day. Quigg Golden can help you find the best way forward, using the comprehensive experience and knowledge of contracts and case law accumulated by our team, even in these particularly problematic situations. Originally published in the Belfast Newsletter on 26 March 2019.